WITH so many cars on the street just like the one you drive, it is convenient to have some little individuality on yours to make it easily identified from the rest. 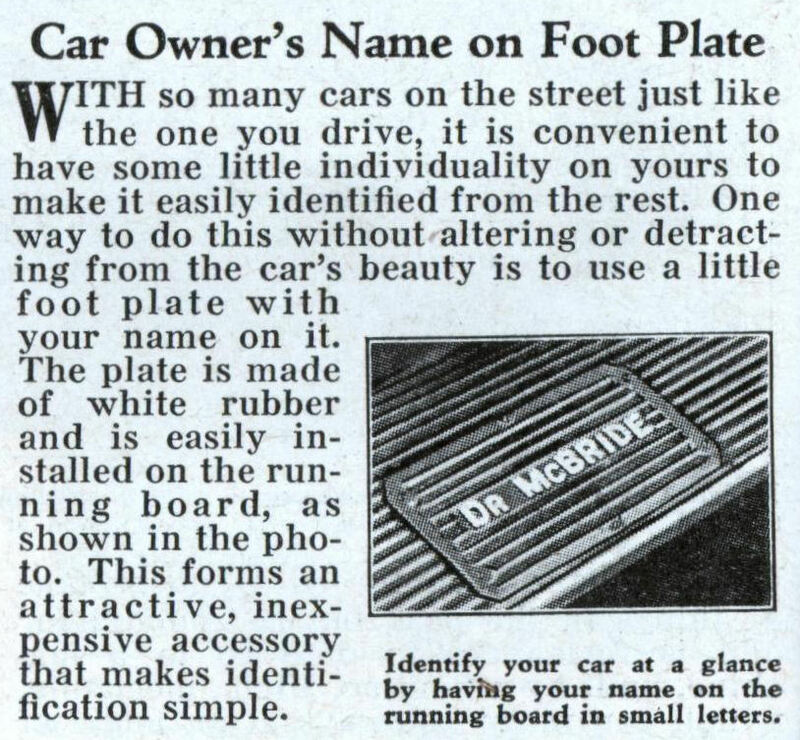 One way to do this without altering or detracting from the car’s beauty is to use a little foot plate with your name on it. 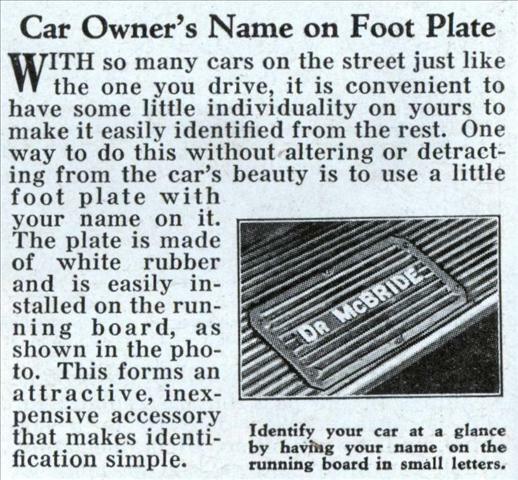 The plate is made of white rubber and is easily installed on the running board, as shown in the photo. 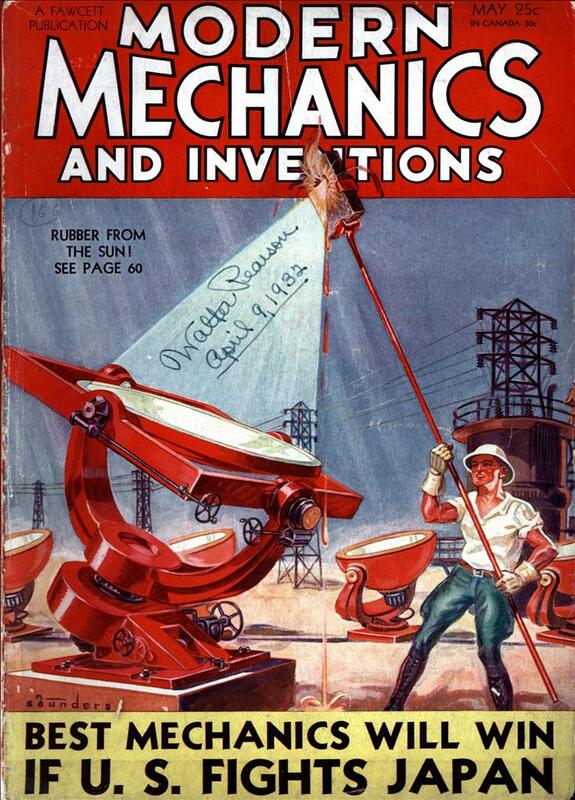 This forms an attractive, inexpensive accessory that makes identification simple. Ohh in Germany they once just numbered the cars. The downside of Henry Ford’s “any color as long as it’s black”: you can’t find your car in the WalMart parking lot! We have two MDs here in town. One is named McBride! I tell which one is mine by the piles of trash in the backseat. I identify my car with a small decorative square of white vinyl that I “stick” on my “bumper.” I’ve heard they are available with humorous messages as well. Chris, I like your idea. A bumper sticker that says “Your Humorous Message Here”. Casandro, here in America we still number cars, with license plates. Oh, yeah Germany does too.